Not a surprise to many in the travel industry, Fastbooking and its Cuban branded Cuba Travel Network have ceased trading earlier this week. Attempts to contact Fastbooking for comment at both their New York and Paris offices have proved unsuccessful. It is unclear why Fastbooking – Cuba Travel Network will no longer provide Hotel Reservations to Cuba but, sources close to their Cuban office say that Fastbooking – Cuba Travel Network had been vexed for some time about dwindling room allocations from Cuba’s Mintur tourism Ministry. Eddie Lubbers, who was head of the Fastbooking operations in Havana Cuba, in a recent interview with Amsterdam’s New School for Information Services or ISSUU acknowledged, “Extreme bureaucracy” and Cuba’s “Closed Economy” as a possible hint as to why Fastbooking and its Cuba Travel Network namesake have ceased GDS sales of Cuban hotels. Fastbooking was founded by Richard and Soraya Kefs in 2000, the couple met while studying at Massachusetts Institute of Technology (MIT) in the 1990s. In 2002 the company began sales of Cuban Hotels through the Cuba Travel Network brand, employing cheap Cuban labor and IT programmers from Havana Cuba’s CUJAE University, along with other outsourced programmers in India. FastBooking quickly shot to prominence on the Cuban Hotel sales scene but, it is suspected that due to their U.S ties, Richard and Soraya Kefs had wished to maintain an arm’s length arrangement concerning their Cuban presence, a possible motive for the elaborate structure of shell companies in Cyprus and Curacao and, ultimately, the Cuba Travel Network brand. Jose Mariño, a past Cuban programmer at their Havana office, who is now living in South America, says he worked almost exclusively on Fastbooking Hotel sales while at their Havana office, known locally as Cuba Travel Network. Jose’s figures seem to reflect some of those found in news archives between 2006 and 2012, in which Eddie Lubbers from Fastbooking Havana, boasted that Fastbooking handled anything from 27,000 to up to 65,000 bookings a year, quite a number for the island nation with just 2 million tourists per year. It is unclear if increased U.S pressure through the Cuban Democracy Act of 1992 or the Helms-Burton Act of 1996 played any role in the demise of Fastbooking – Cuba Travel Network; however, Eddie Lubbers himself is no stranger to such action, since a similar battle was fought in a previous role at Tour and Marketing. 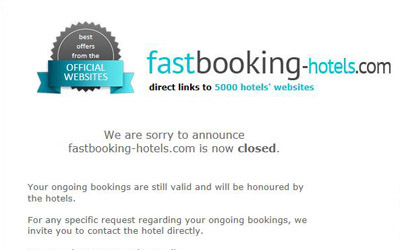 Whom or whatever the reason, as of last week, the main portal and GDS channel provided by Fastbooking was closed, ending 12 years of Cuban Hotel Reservations by the company. At the recent Havana Rhythm and Dance Festival, I was able to probe a few employees of Fastbooking’s Cuba Travel Network office about the recognizably uncertain future – “we are currently handling past Fastbooking reservations, some of which go as far as September 2014, after this we´ll see”. Another staffer said, “We don’t know yet about redundancies”. The demise of Fastbooking Cuba Travel Network could also be part of a continuing trend by Cuba’s Mintur (Tourism Ministry) in which is seeks less reliance on foreign involvement in such a key area of the islands economy. One possible explanation could be the increased presence of the Amadeus GDS in Cuban Hotel distribution. Since signing with Cuba’s tourism ministry in 2008, Spain’s Amadeus has largely overshadowed smaller past partnerships with companies such as Fastbooking. Thankfully, due to the aforementioned Amadeus distribution, tourists to Cuba will see little to no impact concerning the closure of Fastbooking sales of Cuban Hotels.